Millions of people are injured and killed every year on our nation’s roadways. As late drivers rush to make up time, or impaired drivers climb behind the wheel, or even typically responsible drivers take just a second to glance down at a cell phone—dangerous accidents occur. Unfortunately, those poor choices often result in serious, painful consequences for others on the road. When that happens, however, car accident victims do not have to go it alone. Those injured because of someone else’s negligence deserve justice, and the legal system allows them to pursue compensation for their suffering. At Kennedy Hodges, LLP, our experienced and dedicated accident attorneys understand what a difficult and overwhelming time this can be. We work hard to help every client understand their rights and take prompt action to protect their future. While legal action cannot undo the damage done, we can help you obtain the tools to ensure a safe and successful future. 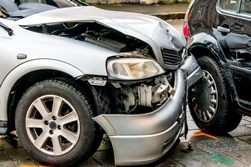 If you or someone you love has suffered injuries in a car accident, we may be able to help. Call us toll free at 855-947-0707 to speak with a member of our team in Houston or Washington, DC and learn more about your legal options. These causes can result in various types of crashes, including rear-end crashes, head-on crashes, vehicle rollovers, T-bone crashes, underride crashes, and many more. Additionally, it is possible for surviving family members to bring a legal case against those responsible when a loved one dies as a result of an auto accident. Even if you aren’t sure if your accident would qualify, reach out to our experienced accident lawyers to learn more about what legal options may be available to you by filling out our online contact form. You’ll receive a prompt response from a member of our team who can answer your questions and get you started protecting your future today. Every case is unique, and the compensation available to you depends on the nature and severity of your injuries. To learn more about your rights, call the experienced injury attorneys at Kennedy Hodges, LLP, at 855-947-0707. Fault states. In a fault state, blame for an accident is assigned, and the party responsible for the accident must pay for any damages to the victim as a result of the accident. Texas is a fault state. No-fault states. In a no fault state, it typically does not matter who is to blame for the accident. Each party will use their own insurance company to cover any damages resulting from the accident. Exceptions can be made in cases where the victim suffered severe injuries. Washington, DC follows no-fault rules for car insurance. In addition, there are different approaches to handling fault once it is determined by the proper authorities. In Texas, the modified comparative negligence rule could assign some degree of fault to all parties involved. In those cases, award settlements could be reduced to reflect the shared blame. In DC, a harsh rule known as contributory fault can prevent victims from obtaining compensation if that victim shared any amount of responsibility for an accident, no matter how small. If you or someone you love has suffered injuries in a car accident, you deserve justice and the compensation vital to your continued well-being. While it can be difficult to think about taking on a legal case soon after an accident, there are time limits to file a claim. In Texas, victims have two years from the date of the accident, while those in DC must file within three years. To ensure that your rights are protected, contact the dedicated attorneys at Kennedy Hodges, LLP, to get started as soon as possible. Fill out our online contact form or call us toll free at 855-947-0707 to learn more about how we may be able to help.